The next story in the Mexican founding saga tells of the tyranny of Huitzilopochtli’s sister, Malinalxochitl (“Grass Flower”). This myth follows after “First Steps From Aztlan” and “Leaving Coatepec,” and sets the stage for the birth of Copil and the further difficulties the fledgling Mexica face. It had been some time since the Mexica had left their ancestral homeland of Aztlan, and they were wandering in the wilds of Michoacan, following Huitzilopochtli’s dream. But the Portentous One wasn’t the only divinity accompanying them — His sister, Malinalxochitl, had come with them. She was beautiful both in form and manner, graceful and elegant. She was also a powerful sorceress, as she was a Huitznahua woman, one of the stars come to walk among men. She could drive men mad, shake a river from its course, or strike her enemies dead with a glance. For a time she ruled them on their wanderings, her flesh and blood guidance complementing unseen Huitzilopochtli’s directions in dreams and her magic a formidable force added to His strength. Eventually, however, Malinalxochitl grew arrogant and tyrannical, forgetting her duty to guard her brother’s tribe. 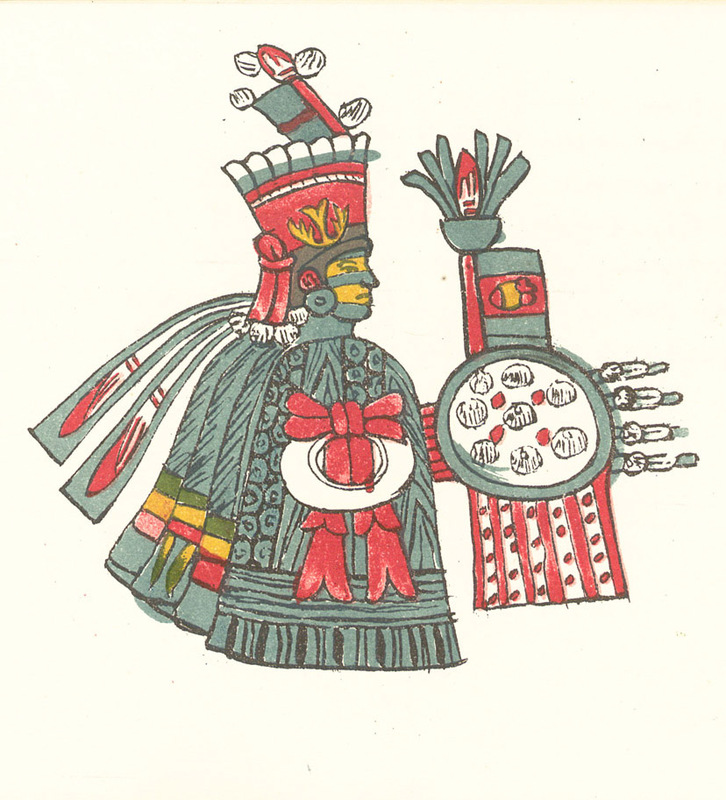 She began to torment the Mexica in Huitzilopochtli’s physical absence. She even forced them to worship her as a goddess on pain of death. The priest agreed, and when he awoke he told the god’s words to the rest of the tribe. When it had grown dark, they packed up and slipped away into the night, leaving Malinalxochitl behind. When she awoke, Malinalxochitl wailed in betrayed anger. “Huiztilopochtli, you dog! I’m not through with You or Your wretched people! My sister and I will be avenged.” Vowing to make them pay, the scorned Huitznahua woman went to make the nearby city of Malinalco her own and to bide her time to strike. This is the next part of the Tenochca founding epic, taking place at about the same time as the “First Steps From Aztlan” part of the story. This part tells about Huitzilopochtli’s tearful departure from His mother, Coatlicue, as He sets out from Coatepec to lead the Mexica south. This one is a little different from the other sub-stories in the saga, as it doesn’t come from the more usual sources of myth. I know of this scene from an apparently Post-Conquest story that tries to shed some light on why the defense of the Aztec homelands failed, and why it seemed the gods abandoned them, especially their trusted patron. In that legend, some of Motecuhzoma’s seers travel to Coatepec to bring Coatlicue a gift, and She speaks of Her son’s departure, and His prophesied return home to Her. I’ve decided to break out Her reference to this event and tell it here, and save the other story for later. Some time after the great battle against Coyolxauhqui and the Centzon Huitznahua, Coatlicue had begun to notice a change in Her son. While once He had been content to stay close to Her side, now He had taken to wandering farther and farther away. Sometimes She would notice Him gazing far to the south, the Land of Thorns, with an intensity that bespoke of great plans and ambition. One day, in the Year of the Flint Knife, She watched Him staring off longingly at some distant southern land again, and She knew in Her heart that Her son was planning to leave. “My beloved son…come to Your mother,” She said quietly. “Son… I know Your heart is already in some place far to the south, not here at Coatepec. Where do You plan to go?” She asked. He paused a moment, glancing back to the left of the Sun. “As usual, nothing escapes Your wisdom, my dear Mother. I need to test My strength, to go on a grand adventure with My people, the Mexica. I have seen it that We will conquer much and found a mighty empire for the glory of the Teteo. How can I resist such an exciting prospect?” He poured out His heart with eagerness, already looking forward to the thrill the future promised. Huitzilopochtli unwrapped it partially, finding two pairs of new sandals within. “One pair is for Your journey south, to the place in Your dreams, Tenochtitlan,” Coatlicue said. With that, He gathered up His shield and Xiuhcoatl, His flaming serpent-spear, and tucked the second set of sandals into His bundle for the trip. He embraced His mother one last time, and with a mixture of sadness and eagerness to see what the future had in store for Him, raced away from Coatepec. He would not see Snake Mountain again for over two hundred years. This is the story of how the Aztecs began as a small band of wild Chichimec nomads and left their original home under the guidance of Huitzilopochtli, searching for their own promised land. In the epic saga focusing specifically on the rise of the Mexica and Huitzilopochtli, this legend comes after the Battle of Coatepec and before the rebellion of Malinalxochitl. Long ago, after the seven tribes had parted ways at Chicomoztoc, the Place of Seven Caves, the Mexica lived as simple nomads in their homeland of Aztlan. They were a wild and hardy clan, not yet educated in the sophisticated ways of the Toltecs, but brave and adventurous. They lived by hunting the wilderness, always on the move in search of new game. In short, they were Chichimecs, barbarian nomads. They gathered their poor possessions and set out from Aztlan, the White Place, a land to the northwest of the place they would eventually call home, Tenochtitlan. They were the seventh and youngest tribe to leave, but they would one day become the greatest of all, the Mexica-Tenochca, Aztecs.